Aga Muhlach was only 17 years old when he became a dad to Luigi, his child with actress Janice de Belen. 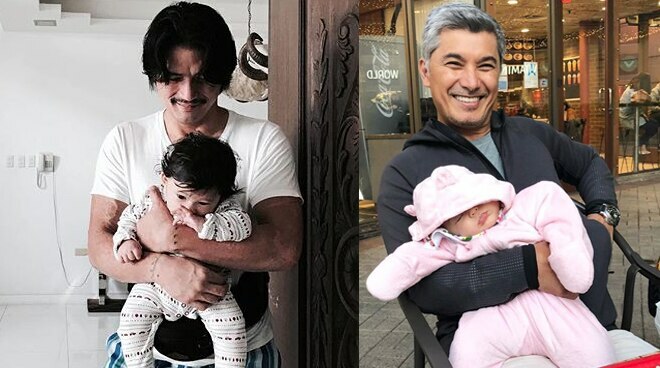 Now 48 and still in possession of his boyish charm, Aga is a granddad to Luigi’s children Alejandro, Adi, and Anya. At 48 years old, Robin Padilla still sports his action star good looks. One wouldn’t know just by looking at him that he’s already a lolo to Mikailah and Alas. The two are his apo from daughters Queenie and Kylie respectively. Albert Martinez is still making ladies swoon with his regular appearance in teleseryes. Looking a lot younger than his age of 57, Albert is a proud and doting lolo to Adalynn, granddaughter from eldest daughter Alyanna. Bong Revilla is a good-looking lolo at 51. He has grandchildren from daughter Inah named Alexa and Inigo; and one from son Jolo named Gab. Rommel Padilla, at 53, is good proof of the Padilla machismo. He dotes on young Raniaah, his granddaughter from son RJ. He even lets her visit him on the set.